Two-sport athletes are exceedingly rare in professional sports. In today’s world of specialization, it is plausible to think we may never see one again. That is why we can look back and appreciate the entertainers who were there for us to watch year round. In this article, I compare and contrast two of the greatest two-sport athletes to ever set foot on this earth, Vincent Edward “Bo” Jackson and Deion Luwynn “Primetime” Sanders. Jackson was a 220-lb physical specimen, who played outfield for the Kansas City Royals, Chicago White Sox, and California Angels. In the baseball offseason for a few brief years, he was the Los Angeles Raiders’ star running back. Sanders was a flashy standout from Florida State drafted by the New York Yankees in the 1988 MLB draft and the Atlanta Falcons in the 1989 NFL draft. Some of his accomplishments include leading the MLB in steals in 1992 and that same year leading the NFL in kick return yards and touchdowns. These athletes were one of a kind without a doubt, but which one was the better? Specifically, which player was the better two-sport athlete? That is, which one was quantifiably more valuable to his teams while playing both sports at the same time? Many articles and blogs have tackled the question “who was the better raw athlete?” But this question does not take into account each star’s value in each sport, just pure athleticism. Using both advanced and more common metrics this article will evaluate which of these players was the better two-sport athlete. Without further ado, let’s see what the data tells us. Who was the superior MLB Player? On the baseball side of things, I used sabermetrics to compare Bo and Primetime. Using advanced metrics allows us to put Jackson and Sanders on the same playing field because as we all know, Jackson was a power hitting machine, while Sanders was a pesky speedster. Specifically, I looked at offensive Wins Above Replacement (oWar, explained here), defensive Wins Above Replacement (dWar), and Runs Above Average (RAA, explained here). For both Jackson and Sanders, I took a 6-year sample of their statistics, the first year being the first year they entered the majors, and the other 5 years being their most active years. Figuring out how to value these players was a challenge. Each had so many intangibles and so much potential on the diamond, but their focus was never fully on baseball. WAR attempts to value a player based on the number of wins they are worth “if they had to be replaced by a backup player at their same position”. 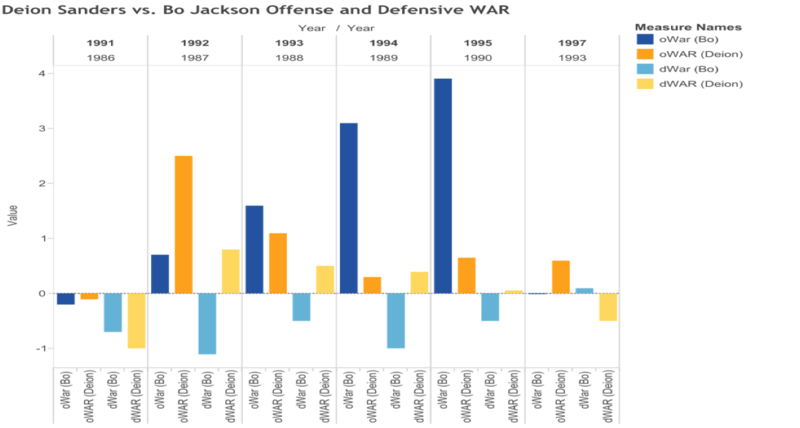 The distinction between offensive and defensive WAR is used for a deeper look at both Jackson and Sanders (and interestingly enough draws some connections between their football positions as Sanders was more of a defensive player in the NFL while Jackson was strictly offensive). Figure 1 displays year-by-year oWAR and dWar for Jackson and Sanders. We see that for both players, their first crack at the majors was tough, especially on the defensive side. However, in both Jackson and Sanders first “active” seasons, 1988 and 1993 respectively, they saw positive changes. Jackson’s oWAR jumped from -0.2 to 0.7 increasing his value to above that of a backup, while Sanders’s oWAR jumped from -0.1 to 2.5, putting him in the range of many solid starting level players. In 1993, Sanders’s dWAR also jumped from -1.0 to 0.8 displaying his improvement in the field. Both players then had a very “active” three-year stretch, 1988-1990 for Jackson and 1993-1995 for Sanders. In this span, Jackson elevated himself to “allstar” levels of oWAR level actually earning himself a spot in the 1989 midseason classic (watch here). However, Jackson’s dWAR was atrocious, ending up below -0.5 for all this three-season stretch. As for Sanders, his oWAR hovered between 0.3 and 1.0 for the 1993-1995 seasons, putting him in the “role player” to “scrub” categories (labels courtesy of fangraphs.com). Defensively, Sanders never had a WAR value above 0.5 from 1993-1995. Once again categorizing him as a major league “scrub”. Looking at just WAR metrics make be a flawed analysis of these players, which led me to look at another advanced metric, Runs Above Average. What RAA attempts to uncover is the number of runs a player contributes relative to an average MLB hitter. 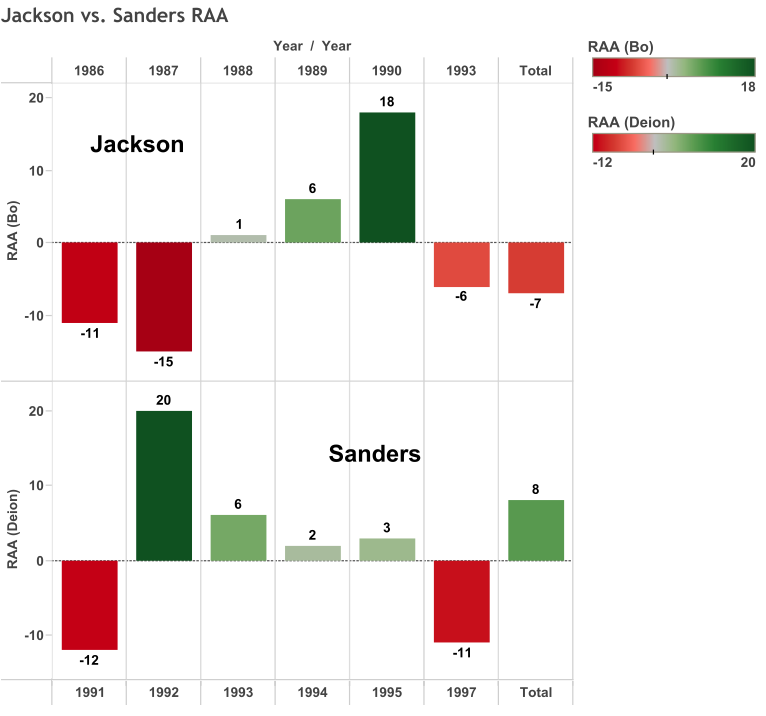 Looking at Figure 2, we see that over the 6-year sample used, Sanders accounted for a higher RAA than did Jackson, meaning he accounted for more runs. And guess what runs do? They help teams win games. So although Sanders’s oWAR was lower than Jackson’s, it is due in larger part to the positional adjustment given to their different positions in the calculation of the stat. Sanders contributed more to his runs to his teams, which in turn may have led to more wins. For example, in 1992, the year Sanders had his highest RAA value, his team, the Atlanta Braves, reached the World Series (which they lost, but Sanders went 8/15 with a 0.588 OBP in the World Series). His runs contribution directly to the Braves success, as seen in their performance, while Jackson’s Kansas City Royals did not make the playoffs once while he was on the team. So although Jackson had the edge when analyzing WAR metrics, Sanders gets the nod when looking at RAA and in his teams’ accomplishments. Take these conclusions with a grain of salt, but data doesn’t lie folks. Conclusion: Slight edge to Jackson, but not as great a difference as is usually credited. Although Sanders had the upper hand in RAA, Jackson’s oWAR was that of an elite player. Comparatively, Sanders metrics measured up to more of a role player. Watching videos on the two, you can tell Jackson was a quality starter while Sanders was a 4th outfielder and situational player (he played over 100 games only once). Who was the superior NFL Player? Coming out of Auburn, Jackson was an absolute stud. The man was a Heisman Trophy winner, All-American, and Sugar Bowl champion. His decision to opt for a baseball career over pro football was a major shock and one of the biggest sports stories of the day, and actually resulted in him never playing a full NFL season. When he returned to football in 1987, he took the NFL by storm, playing in 7 games and averaging 6.8 yards per carry. Sanders was just as highly touted. After leading Florida State to the #3 AP Ranking his senior year, he was drafted 5th overall by the Atlanta Falcons, and started 10 games in his rookie season. Before we start the football portion of the analysis, I want to mention that this was an extremely difficult task. Without a subscription to profootballfocus.com I had little or no access to advanced NFL metrics, not to mention that advanced metrics in the NFL are not nearly as developed in the MLB. So how do we evaluate Bo and Primetime? I looked at scoring statistics, season averages, and career achievements. Jackson never played a full NFL season, as he was adamant about finishing the baseball season before starting football each year. In his most productive year, 1989, Jackson rushed for 950 yards on 173 attempts, while averaging 86.4 yards per game (good for 4th in the league). Over a 16 game season, that projects to 1,382.4 yards, a completely plausible season total for Jackson. That year, the LA Raiders had the 9th best rushing attack, largely due to Jackson. Also, note that this was Jackson’s sole year as an MLB All-Star. So, he was managing the two-sport balancing-act as well as anyone could hope. He continued his ascent to NFL stardom in 1990, as he rushed for nearly 700 yards and got into the endzone 5 times, all on his way to making the Pro Bowl. Unfortunately, this is where his NFL career ended, as he suffered what turned out to be a career-ending a hip injury during the 1990 NFL playoffs against the Bengals. But what we do know is that Jackson accounted for 8.5% of the Raiders scoring from 1987-1990 while only playing in 59% of their games. In table 1, are his projected yards and touchdown number if he played all 16 games in each of his four years in the NFL. Jackson’s impact on the Raiders was clear, so how does he stack up against Sanders? Sanders had a much different football career than Jackson. Jackson had a very short career, and therefore a much small sample size to work with, while Deion spent 14 years in the NFL. Jackson played offense while Sanders was primarily a defense and special teams player. As I stated above, advanced metrics are much less refined in football than in baseball, so it is comparatively more difficult to analyze players on different sides of the ball. But I digress: this analysis will continue. Sanders had an immediate impact upon entering the NFL. He started 10 games as a rookie, and by his second season was a full-time starter. He led the league in interceptions returned for touchdowns in 1994, and was an 8-time Pro Bowler, and 6-time All Pro. Sanders was a unique player in that he was involved in all 3 facets of the game: offense, defense, and special teams. Need proof? 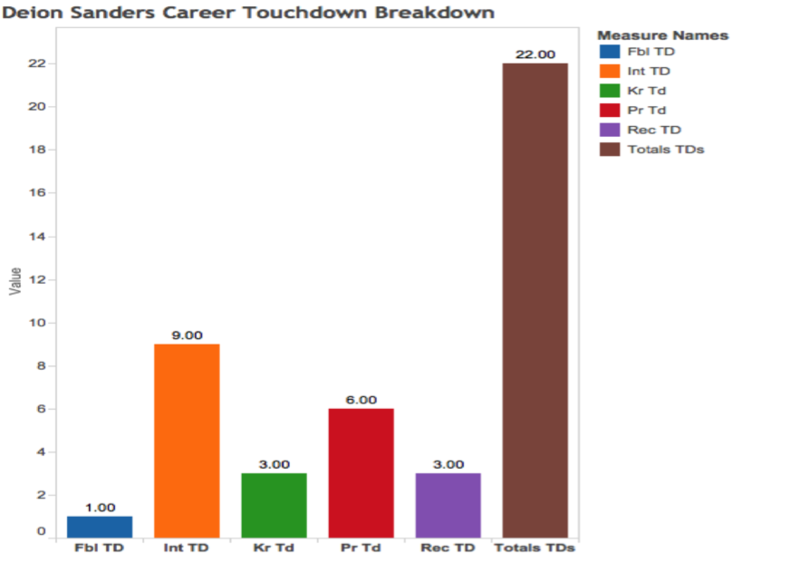 Figure 3 breaks down Sanders’s touchdown numbers. In 1996, after playing defense for the first 7 years of his career, Sanders decided he wanted to play receiver and cornerback. He caught for 475 yards and a touchdown, recorded two interceptions, and he returned a fumble for a touchdown. Sanders led the league in non-offensive touchdowns in 1989 and 1998 reaching the end zone 3 times in both seasons. The real proof of Primetime’s greatness is that game in and game out, Sanders lined up against opponent’s best wide outs and shut them down. His skills were rewarded in 1994 with the 49ers, when he was named the Defensive Player of the Year. That year the 49ers had the 6th best defense in the league allowing only 15 passing touchdowns while intercepting 23 passes. Sander’s shutdown corner skills essentially cut the field in half for most quarterbacks. Teams game planned around Deion, and this intimidation was invaluable to each and every team Deion played for. Throughout his career, Deion played for 7 top 10 ranked defenses, and this was no coincidence. Need more proof of Deion’s value on the gridiron? Checkout this highlight reel. Case closed. Conclusion: Sanders. People who saw Bo Jackson play often fell in love with his combination of grace, speed, and power, but Sanders was the better football player. The NFL community agrees, as Sanders is a hall of famer. Who was the better two-sport athlete? My analysis, using advanced MLB metrics supported the widespread view that Jackson was the superior MLB player, although not by as much as the conventional wisdom usually states. As for the football, using basic projections, scoring numbers, and regular statistics it is pretty clear that Deion Sanders was the superior NFL player. So does the contest end in a tie? Not quite. Although Jackson had the edge in baseball, his margin was quite small, whereas Sanders’s gap in football was more substantial. Think about it, in 1994 Sanders won the Defensive Player of the Year after playing 138 games in the baseball season. He was an everyday start in two professional sports, a feat that is unheard of. Jackson was equally as impressive, but he couldn’t sustain his success while playing both sports. To conclude, and answer our original question of which of these athletes was quantifiably more valuable to his teams while playing both sports? According to this analysis Deion Sanders is my pick as the better two-sport athlete. By no means is this an unassailable argument, but it is one that is supported by the numbers, and one that would surely make Primetime very happy. Note, RAA is taken into account when calculating oWAR. Specifically, an RAA value of 10 is equal to 1 unit of oWAR. Additionally, oWAR adjusts for position while RAA does not. Jackson was usually a left fielder or DH while Deion was primarily a center fielder. This mean there were different replacement values for each position, implying that each players statistics may be slightly skewed. I used 250 plate appearances as a lower bound on their most “active” 5 years. Note I did use statistics for Jackson after his injury for the 1993 season. This was tough to analyze and proved to be less quantitative than the MLB analysis due in part to the lack of access to advanced football metrics and Jackson’s short playing career.